Experts and officials in East Asia are increasingly looking at other examples of US extended nuclear deterrence, not least the North Atlantic Treaty Organization (NATO). The heightened interest in NATO’s nuclear-sharing mechanism, including the deployment of US tactical nuclear weapons on European soil and the Nuclear Planning Group (NPG) as a venue to discuss nuclear issues in the alliance, shows a great deal about how East Asian debates are evolving. The “NATO model” of managing extended nuclear deterrence is being discussed as what the US allies in East Asia might want to adopt. The NATO model, at least for some, appears to be more effective in terms of maintaining and strengthening the credibility of US extended deterrence in an era of increasing security threats and challenges exemplified by North Korea’s missile and nuclear development and China’s military build-up. It has become popular to compare Europe and East Asia in the Western nuclear policy and deterrence community, resulting in an increasing number of comparative works on deterrence.4 It is true that there is a clear and substantial difference between the NATO model and the practices in East Asia—mainly the US-Japan and US-Korea alliances—or the East Asia model. The former is based on nuclear-sharing and the forward deployment of US nuclear weapons, whereas the latter lacks such features, which this article generally shares. However, it is a matter of degree, and this article argues the need to move beyond such a dichotomy, so that East Asia and Europe could learn from each other’s practices and experience. A little ironically in Europe, more experts and officials are getting interested in an East Asia model of extended deterrence, which, unlike NATO’s case, does not involve the forward deployment of US nuclear weapons among other differences. What stimulates this interest is obviously the ongoing debates in Europe on the future of US tactical nuclear weapons. For those who argue for the withdrawal of such weapons, the East Asian model looks promising, as it appears to be demonstrating that the credibility of US extended deterrence can still be maintained without the forward deployment of nuclear weapons. Yet others, who support the continued deployment of tactical nuclear weapons in Europe, regard the East Asian model in exactly the opposite way. 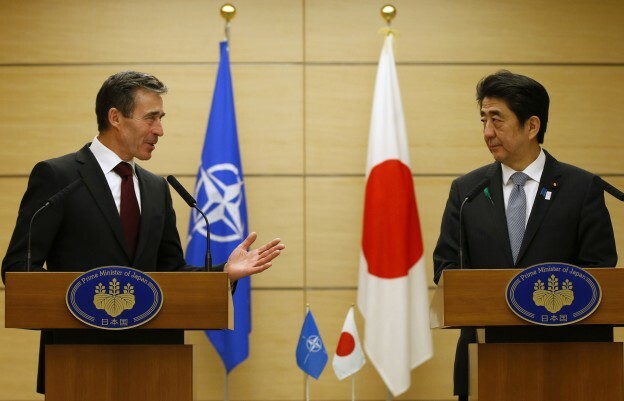 They argue that because of the lack of physical element that underwrites the US nuclear commitment, US allies in East Asia are increasingly weary of the credibility of extended deterrence and beginning to look at the NATO model as a way forward. They conclude, therefore, it is not a choice NATO should take for its future. The increasing mutual interest between East Asia and Europe, in itself, might be something that should be welcomed given a long history of little interaction between the two regions regarding the issues of deterrence and nuclear weapons. However, so as to avoid superficial or misguided discussions, there needs to be a solid understanding of the similarities and differences of the European and East Asian debates on extended nuclear deterrence, the role of nuclear weapons, and wider regional strategic environments in which the two regions are situated.Only through having such an intellectual foundation, generic issues that both Europe and East Asia need to address could be explored. This article first reviews some of the significant characteristics of both the NATO and East Asian models of extended nuclear deterrence. It then examines common challenges that both Europe and East Asia need to address today: the meaning of the forward deployment of nuclear weapons; the nature of nuclear consultations; and the means to counter nuclear saber-rattling and fears of limited use of nuclear weapons by adversaries. NATO identifies itself as a “nuclear alliance,” though there is no official definition of what it means. At a minimum, it means that nuclear weapons play a role in the alliance’s deterrence and defense posture. Indeed, nuclear weapons constitute one of the most important components in NATO’s “appropriate mix” of tools for deterrence and defense, demonstrating that NATO allies are covered by the US nuclear commitment. However, if that is all the nuclear alliance means, it would not look special: Washington has repeatedly made explicit nuclear commitments to Japan and South Korea as well. Rather, what makes the NATO model special is its notion of the “broadest possible participation of Allies in collective defense planning on nuclear roles, in peacetime basing of nuclear forces, and in command, control and consultation arrangements.”5 No other US allies are involved in the “broadest possible participation” in such a wide range of nuclear activities with the United States. While never officially acknowledged, it is widely believed that five NATO countries in Europe—Belgium, Germany, Italy, the Netherlands, and Turkey—host around 180 US tactical (non-strategic) nuclear weapons—B-61 gravity bombs—on their soil today.6 Those warheads are supposed to be employed by dual-capable aircraft (DCA) of those European countries as well as the United States under the alliance’s nuclear-sharing arrangements. For this mechanism to continue, European DCA fleets need to be certified regularly by the United States, which involves sharing technical information and expertise on nuclear weapons, as the highly exclusive “nuclear club” within the alliance. NATO has experienced a series of crises involving the credibility of US extended deterrence. Nevertheless, the fact that NATO enjoys all possible measures—both consultative and physical means—regarding extended nuclear deterrence, something other US allies lack, makes the NATO model unique and attracts the attention of those who look for ways to strengthen the US extended nuclear deterrence commitment. In contrast, the United States had a clear idea of what it wanted regarding nuclear weapons vis-à-vis Japan as part of its global strategy and extended deterrence. It needed to secure, first, the right of transit of nuclear weapons or “nuclear visiting”—port calls in Japan by US navy vessels carrying nuclear weapons; and second, the right to re-introduce nuclear weapons to Okinawa in time of dire emergency. After much hesitation and lengthy negotiations, Japan and the United States concluded a series of secret agreements and reached a common understanding on those matters. Though Tokyo had long denied any secret agreement in this regard, a government led by the Democratic Party of Japan in 2010 revealed the existence of some explicit and implicit secret agreements and understandings between the two reached during the Cold War.12 The fact that Japan allowed nuclear-armed US vessels to visit Japanese ports and was prepared to let the US re-introduce nuclear weapons in an emergency is thought to have strengthened the deterrence posture of the US-Japan alliance. After the withdrawal of all the US nuclear weapons from Okinawa in the early 1970s, the ultimate guarantee of Japan’s defense has been US strategic weapons as well as Japanese and US conventional forces. Mainly because of the fact that the conventional balance vis-à-vis the Soviet Union and China has been consistently in favor of the US-Japan side, Japan’s need to depend on the nuclear element of extended deterrence has remained low. Also, there has been a high level of “nuclear allergy” in Japan, making it difficult for many Japanese to address nuclear weapon issues in concrete and militarily logical terms. As James Schoff argues, “how deterrence worked mattered little” to Japan and “Tokyo seldom concerned itself with details” about extended deterrence.13 Elbridge Colby is blunter, describing Japan’s attitude as “see no evil, hear no evil.”14 In such a situation, not much serious debate took place on how Japan can be involved in US nuclear doctrine and planning. The situation began to change only after North Korea’s accelerating nuclear development and the changing conventional balance due to China’s military build-up. Japan and South Korea have been making more efforts to maintain and enhance the credibility of US extended deterrence, facing what they perceive as a deteriorating security environment, most notably due to China and North Korea. These dialogue frameworks have quickly become a premier venue to discuss extended deterrence issues between the allies and an “assurance tool” by fostering a “sense of inclusion” for Japanese and Koreans. The dialogues now include table top exercises based on high-intensity contingencies and onsite visits to US nuclear facilities.20 The Obama administration has shown greater willingness to institutionalize and expand these dialogues, indicating that the United States accepts the fact that it is not in the US interest to leave allies ill-informed about US intentions (policies) and capabilities and questioning the US commitment. Keeping the allies well informed and updated is now seen as one of the surest ways to reassure them, i.e., “educating” the allies from the US point of view. While accepting visits of US vessels carrying nuclear weapons may not seem to be a substantial form of nuclear burden-sharing, it was significant enough that New Zealand’s decision to reject such visits in the mid-1980s caused the Reagan administration to withdraw a security commitment from the island nation.23 While what the US navy wanted in New Zealand was mainly to secure a place for the crew to take a rest—therefore not for military operational purposes—this incident has demonstrated the significance placed on “nuclear visiting.” As has been discussed above, Tokyo during the Cold War tacitly allowed US vessels carrying nuclear weapons to call on ports in Japan. The relative significance of each measure keeps changing contingent on the evolving international security environment and US interests and concerns. For example, it can be argued that Japan’s ballistic missle defense capability matters more than participation in NATO’s nuclear support mission in military terms. There are diverse forms of nuclear burden-sharing; one does not always need to host US nuclear weapons. Despite different contexts, security situations, and histories, Europe and East Asia are now facing an increasingly common challenge regarding how to maintain the credibility of US extended nuclear deterrence. Three major challenges are discussed below. The question to what extent the forward deployment of tactical (non-strategic) nuclear weapons on allies’ soil is necessary for the purpose of maintaining the credibility of US commitment remains controversial. Put simply, it is a question of how much visibility matters to the credibility of the US commitment.24 One of the most important advantages of forward-deployed nuclear weapons is that those are visible. We may still have an instinct of “seeing is believing.” That was why the US decision to retire nuclear-tipped Tomahawk cruise missiles (TLAM/N) became controversial in the run-up to the 2010 NPR.25 While TLAM/N had not been deployed to Asia since the 1990s, it was seen as one of the most deployable of US nuclear weapons. Although the debates on the pros and cons of the retirement of TLAM/N now look outdated, one question that remains not fully answered is why, on the one hand, TLAM/N was judged to be substitutable by other means like the deployment of bombers and fighters in contingencies in the Asia-Pacific theater, but on the other hand, the forward deployment of US tactical nuclear weapons on European soil could not be substituted by other means. It is, indeed, easy to point to different contexts and histories, and institutional inertia certainly plays a role when it comes to NATO’s nuclear posture. While fully recognizing the uniqueness of NATO’s arrangements, the United States would still need to do a better job explaining why there is such a difference in its position on the “substitutability” of forward deployment of nuclear weapons, i.e., it needs to better legitimize the continuing deployment of tactical nuclear weapons in Europe in a more generic and coherent way beyond simply relying on the uniqueness of NATO.26 Such an exercise would sharpen our understanding on when and where forward deployment of nuclear weapons is still needed and desirable and when and where it is not. 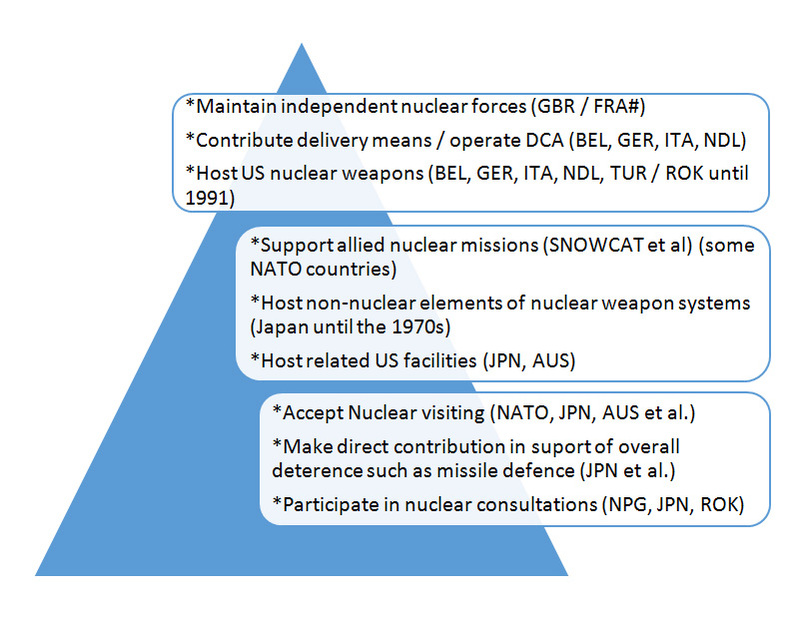 The role of consultations on nuclear-related issues is likely to increase in both NATO and East Asia. As for NATO, despite the fact that any talk of withdrawing US non-strategic nuclear weapons from Europe has all but disappeared in the wake of the Ukraine crisis, the need for DCA states to replace their aging fleets remains, and the time for decision is approaching. It will not be easy for countries to decide to replace DCA; NATO will have to prepare a “Plan B” in case European allies lose DCA. It will not be an end to NATO’s status as a nuclear alliance. There have already been various ideas put forward by experts on how NATO could maintain elements of nuclear-sharing, if not all the features that exist today, without the physical presence of US nuclear weapons on allied territory or without European DCA capability,27 including keeping selected nuclear storage facilities certified for a possible return of nuclear weapons when needed, maintaining European DCA capability at the NATO level rather than at the national level, and sending allied officers to the United States, and letting them be involved in US nuclear missions. But if US nuclear weapons in Europe and/or European DCA capabilities were to be lost, the basic nature of NATO’s nuclear-sharing or, more broadly, the mechanism of risk- and responsibility-sharing, would have to change substantially. That is exactly why NATO needs to start thinking about how it can continue nuclear consultations without relying on the physical elements of nuclear-sharing—or how it can prevent the NPG from becoming nothing more than a “tea ceremony.”28 In such a situation, challenges for NATO allies, on the one hand, and Japan and South Korea, on the other, would look more similar. Japan and South Korea are latecomers in this regard, and there are certainly many lessons that the two need to learn from NATO’s experience of nuclear consultations—both successes and limitations; however, the interaction between NATO and US East Asian allies could, in the coming years, become more mutual rather than just a one-way street, where only Asians learn from the other. In the final analysis, the biggest challenge for US allies in both Europe and Asia is how they can keep Americans serious about such consultations. The good news is that under the Obama administration the United States seems to understand more than ever before that keeping allies well informed and updated is probably the most effective way to reassure allies about the credibility of US extended deterrence. However, the undeniable fact remains that everything depends on US willingness, which cannot be taken for granted. Therefore, allies in Europe and East Asia need to keep showing to the Americans the merits of maintaining nuclear consultations with their allies, including through shouldering more burden and responsibilities. The newest nuclear-related challenge that confronts both Europe and Asia concerns nuclear saber-rattling by Russia and related fear of the limited use of nuclear weapons by adversaries—mainly Russia, but to a lesser extent China as well. In the wake of the Ukraine crisis, Vladimir Putin and his top aides have repeatedly reminded the world that Russia is still a country possessing one of the world’s largest nuclear arsenals and intimidated neighbors by showing Russia’s willingness and preparedness to use nuclear weapons even in regional conflict. Russia has conducted a series of military exercises involving simulated nuclear attacks.29 Such actions have largely been targeted against NATO, but East Asia cannot be immune from Russia’s stepped-up nuclear saber-rattling in the light of its increasingly assertive actions in East Asia. There are growing calls to adapt NATO’s nuclear posture, starting with declaratory policy to counter Russia’s moves, which is also a matter of concern for Japan and South Korea. There needs to be consultations between NATO and US allies in Asia to ensure unity and synergy. While geographically distant, NATO’s European allies and Japan and South Korea are increasingly facing a similar set of challenges, including the issue of extended nuclear deterrence.The United States maintains a number of allies and partners across the globe, but only selected allies enjoy an explicit nuclear commitment—a privileged status, something an Australian expert calls “premium content” of extended deterrence.32 This suggests that in thinking about managing the extended nuclear deterrence relationship with the United States, NATO and East Asian allies need mainly to look at each other. That is exactly why it is imperative to move beyond the dichotomy between the NATO and East Asian models and seek a synergy. 1. The views expressed in this article are the author’s alone and do not represent those of the NIDS, the Ministry of Defense, or the Government of Japan. 2. See, for example, Andrew O’Neil, Asia, the US and Extended Nuclear Deterrence: Atomic Umbrellas in the Twenty-First Century (Abingdon: Routledge, 2013); Rod Lyon, “The Challenges Confronting US Extended Deterrence in Asia,” International Affairs 89, no. 4 (2013). 3. “Remarks by President Barack Obama in Prague as Delivered,” Prague, April 5, 2009. 4. See, for example, David Yost, “US Extended Deterrence in NATO and North-East Asia,” in Perspectives on Extended Deterrence, Recherches & Documents, no. 03/2010 (Paris: Fondation pour la Recherche Stratégique, 2010); Michito Tsuruoka, “Why the NATO Nuclear Debate Is Relevant to Japan and Vice Versa,” Policy Brief (Washington, DC: German Marshall Fund of the United States, October 2010); Joseph Pilat, “Reversal of Fortunes? Extended Deterrence and Assurance in Europe and East Asia,” Journal of Strategic Studies, 2016 (advance online publication). 5. Quoted from NATO’s 2010 Strategic Concept. See “Active Engagement, Modern Defence: Strategic Concept for the Defence and Security of the Members of the North Atlantic Treaty Organization” (approved by Heads of State and Government at the NATO Summit, Lisbon, November 19-20, 2010), paragraph 19. 6. For the latest estimate, see Hans Kristensen, “United States Nuclear Forces, 2016,” Bulletin of Atomic Scientists 72, no. 2 (2016). 7. One of the latest works on this is Andreas Lutsch, “Merely ‘Docile Self-Deception’? German Experiences with Nuclear Consultation in NATO,” Journal of Strategic Studies, 2016 (online advance publication). For the most detailed account on the origins and early practices of nuclear consultation, see Paul Buteux, The Politics of Nuclear Consultation in NATO 1965-1980 (Cambridge: Cambridge University Press, 1983). 8. David Yost, “Assurance and US Extended Deterrence in NATO,” International Affairs 85, no. 4 (2009); Guy Roberts, “Role of Nuclear Weapons in NATO’s Deterrence and Defense Posture Review: Prospects for Change,” in Tactical Nuclear Weapons and NATO, eds. Tom Nichols, Douglas Stuart, and Jeffrey McCausland (Carlisle: United States Army War College, 2012), 393. 9. On the enduring value of this, see Michael Quinlan, Thinking about Nuclear Weapons: Principles, Problems, Prospects (Oxford: Oxford University Press, 2009), 42-43. 10. For details, see Ota Masakatsu, Nichibei “kaku mitsuyaku” no zenbo (Tokyo: Chikuma shobo, 2011), Ch. 2. 12. See Hatano Sumio, Rekishi toshite no Nichibei anpo joyaku: kimitsu gaiko shiryo ga akasu “mitsuyaku” no kyojitsu (Tokyo: Iwanami shoten, 2010); Okada Katsuya, Gaiko o hiraku: kaku gunshuku, mitsuyaku mondai no genba de (Tokyo: Iwanami shoten, 2014), Chs. 1-9. 13. James Schoff, “Changing Perceptions of Extended Deterrence in Japan,” in Strategy in the Second Nuclear Age, eds. Toshi Yoshihara and James Holmes (Washington, DC: Georgetown University Press, 2012), 101 and 104. 14. Elbridge Colby, “US Nuclear Weapons Policy and Policymaking: The Asian Experience,” in Tactical Nuclear Weapons and NATO, eds. Nichols et al., 91. 15. Scott Snyder and Joyce Lee, “Infusing Commitment with Credibility: The Role of Security Assurances in Cementing the U.S.-ROK Alliance,” in Security Assurances and Nuclear Nonproliferation, ed. Jeffrey Knopf (Stanford: Stanford University Press, 2012), 169. There are other accounts arguing that the George H.W. Bush administration consulted with South Korea in advance and explained the continued US commitment. However, what seems clear is that regardless of the Bush administration’s intentions, South Koreans were not fully satisfied with the US decision. Unlike NATO’s consensus-based decision-making, Seoul did not have any formal voice. 16. See Kang Choi and Joon-sung Park, “South Korea: Fears of Abandonment and Entrapment,” in The Long Shadow: Nuclear Weapons and Security in 21st Century Asia, ed. Muthiah Alagappa (Stanford: Stanford University Press, 2008); Jonathan Pollack and Mitchell Reiss, “South Korea: The Tyranny of Geography and the Vexations of History,” in The Nuclear Tipping Point: Why States Reconsider Their Nuclear Choices, eds. Kurt Campbell, et al. (Washington, DC: Brookings Institution Press, 2004). 17. Mark Fitzpatrick, Asia’s Latent Nuclear Powers: Japan, South Korea and Taiwan (Abingdon: Routledge for IISS, 2016), 17. 18. See Brad Roberts, The Case for U.S. Nuclear Weapons in the 21st Century (Stanford: Stanford University Press, 2016), 200-204. Roberts, at that time, was deputy assistant secretary of defense for nuclear and missile defense policy and a chief initiator of those dialogues with Japan and Korea. 19. The DSC was established by combining the EDPC and Counter-Missile Capabilities Committee (CMCC). See “The 7th Korea-U.S. Integrated Defense Dialogue (KIDD),” Press Operations, Release No. NR-130-15, Washington, DC, April 15, 2015. 20. Robert Manning, “The Future of Extended Deterrence in East Asia to 2025,” Atlantic Council, October 2014, 11-12 and 14; Michito Tsuruoka, “Nuclear Proliferation, Deterrence and Strategic Stability in East Asia: The United States, China and Japan in a Changing Strategic Landscape,” in Routledge Handbook of Nuclear Proliferation and Policy, eds. Joseph Pilat and Nathan Busch (Abingdon: Routledge, 2015), pp. 59-61. 21. Hans Kristensen, “Polish F-16s in NATO Nuclear Exercise in Italy,” Federation of American Scientists, October 27, 2014. 22. See, for example, O’Neil, Asia, the US and Extended Nuclear Deterrence, 109. 23. The most detailed account can be found in Michael Pugh, The ANZUS Crisis, Nuclear Visiting and Deterrence (Cambridge: Cambridge University Press, 1989). 24. Elaine Bunn, “The Future of US Extended Deterrence,” in Perspectives on Extended Deterrence, 41. 25. For a concise, balanced overview from a Japanese perspective, see Nobuyasu Abe and Hirofumi Tosaki, “Understanding Japan’s Nuclear Dilemma: Deterrence before Disarmament,” in Disarming Doubt: The Future of Extended Nuclear Deterrence in East Asia, eds. Rory Medcalf and Fionna Cunningham (Woollahra: Lowy Institute for International Policy, 2012). 26. Tsuruoka, “Why the NATO Nuclear Debate Is Relevant to Japan and Vice Versa,” 2. 27. See, for example, Karl-Heinz Kamp and Robertus Remkes, “Options for NATO Nuclear Sharing Arrangements,” in Reducing Nuclear Risks in Europe: A Framework for Action, eds. Steve Andersen and Isabelle William (Washington, DC: Nuclear Threat Initiative, 2011), 13–32; George Perkovich, et al., Looking Beyond the Chicago Summit: Nuclear Weapons in Europe and the Future of NATO, The Carnegie Papers (Washington, DC: Carnegie Endowment for International Peace, April 2012); Jeffrey Larsen, “US Extended Deterrence and Europe: Time to Consider Alternative Structures?” in The Future of Extended Deterrence: The United States, NATO, and Beyond, eds. Stéfanie von Hlatky and Andreas Wenger (Washington, DC: Georgetown University Press, 2015). 28. Tsuruoka, “Why the NATO Nuclear Debate Is Relevant to Japan and Vice Versa,” 1-2. 29. See Jacek Durkalec, “Nuclear-Backed ‘Little Green Men’: Nuclear Messaging in the Ukraine Crisis,” Report (Warsaw: Polish Institute of International Affairs, July 2015); Matthew Kroenig, “The Renewed Russian Nuclear Threat and NATO Nuclear Deterrence Posture,” Issue Brief (Washington, DC: Atlantic Council of the United States, February 2016). 30. On the need to consider adversaries’ limited use of nuclear weapons, see Jeffrey Larsen and Kerry Kartchner, eds., On Limited Nuclear War in the 21st Century (Stanford: Stanford University Press, 2014). 31. See also Michito Tsuruoka, “NATO’s Challenges as Seen from Asia: Is the European Security Landscape Becoming Like Asia?” The Polish Quarterly of International Affairs 25, no. 1 (2016). 32. O’Neil, Asia, the US and Extended Nuclear Deterrence, 121.